Ice Fire XJ711 Fleece Figure Skating Jacket - Criss-Cross. 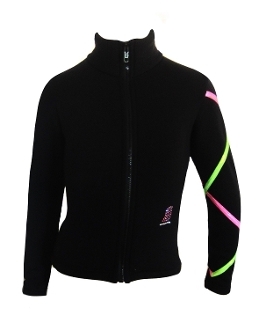 The Ice Fire XJ711 figure skating jacket is made with power stretch fleece and a Criss Cross design. Criss cross stripes made with Shimmer Matrix fabric. This jacket offering warmth and stretch to provide comfort and freedom of movement during practice. Functional and stylish - this ice skating jacket will be look great separately or as a part of ice skating outfit with Criss Cross ice skating pants. Available in several colors in Child XSmall - Adult L.
Click on images to view sizing chart.